Super Bowl Sunday is right around the corner! 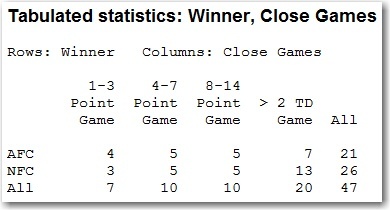 But instead of trying to break down and predict the outcome of the game (which will likely come down to turnovers, which are impossible to predict), I’m going to look at some different statistics from previous Super Bowls. How many close games have there been? 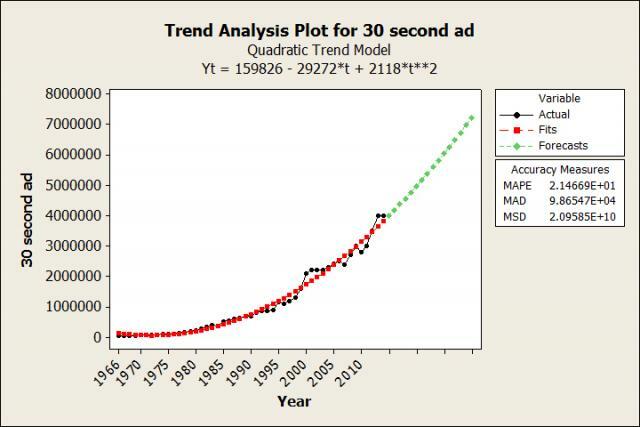 How much has the price for a 30-second add increased over the years? 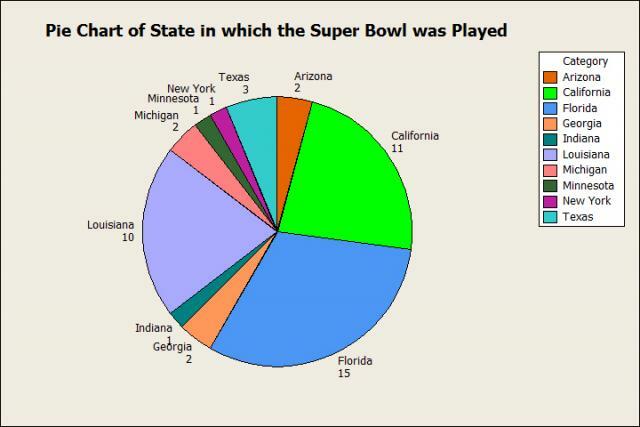 Which state has hosted the Super Bowl the most times? I’ll look at them all! First, I’m going to look at different things that have happened in the game. Five of the last 6 Super Bowls have been decided by less than a touchdown. But in general, are most Super Bowls close games? It looks like we’ve been spoiled the last few years. Just under 63% of Super Bowls have had the margin in the final score be greater than a touchdown. And just under 15% have been within a field goal. Overall, the NFC has won 5 more Super Bowls than the AFC. 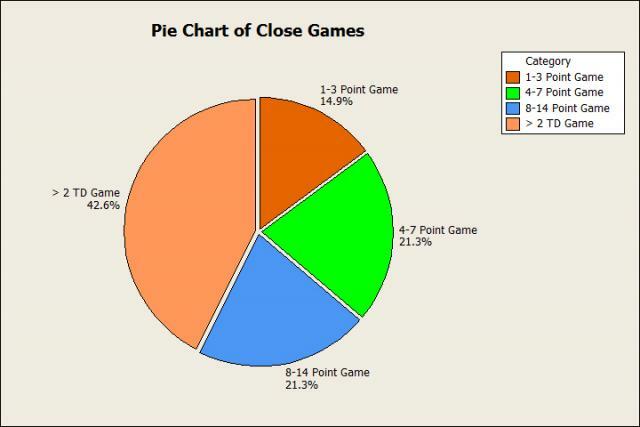 We can use our close game groups to see if they are lucky to have this advantage (won more close games, which are pretty random), or if they earned it (more blowout wins). For games decided by two touchdowns or less, the AFC and NFC have won pretty much the same amount of games. But the NFC has almost twice as many blowout wins. So the advantage held by the NFC in the Super Bowl is hardly because of luck. They’ve earned it by blowing out the AFC team almost twice as often as the AFC team blows them out. 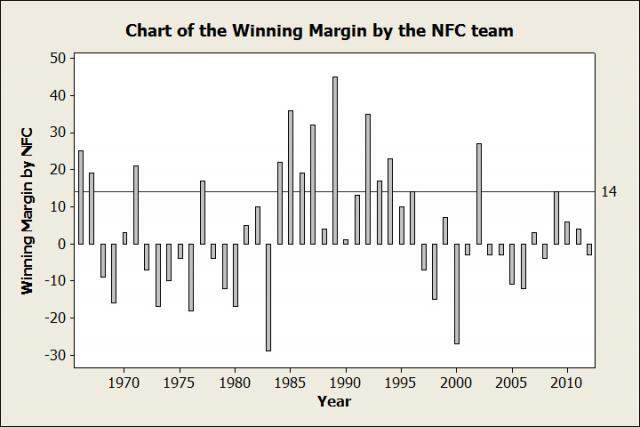 We can use a bar chart to determine whether there was a certain time period when the NFC was dominant. From 1984 to 1996, the NFC won 13 straight Super Bowls, with 8 of them coming by more than 2 touchdowns. It was the era dominated by Joe Montana, Jerry Rice, Troy Aikman, and Emmitt Smith. Clearly the AFC had no answer for these NFC stars. But I’m going to stick to the most well-known gambling bet, the spread. I found the spread for every Super Bowl, so let’s see who has covered more often. The favorite has covered the Vegas spread more often, winning 7 more times than the underdog. However, the underdog may still yet get the last laugh. In the 19 games where they’ve covered the spread, they’ve won 13 of those games outright! And the average spread in those 13 games was 7.7 points. So if you’re in Vegas and thinking of taking the Seahawks on Sunday, it might be best to just bet on them to win instead of taking the points. Now for the most interesting statistic, let’s look at every double digit Super Bowl underdog. There have been a total of 14 of them. Here is the summary of what happened in those games. Joe Namath guarantees victory, then backs up his words as the New York Jets upset the Baltimore Colts, who were 18 point favorites. Little-known quarterback Tom Brady leads the New England Patriots to a shocking upset of the St. Louis “Greatest Show on Turf” Rams, who were 14-point favorites. Now very well known, Tom Brady and the Patriots are undefeated and 12-point Super Bowl favorites, but are unable to finish the season perfect as they fall to the New York Giants and David Tyree's helmet. So remember, next time there is a double-digit favorite, it may be in your best interest to take the underdog to win! Watching the commercials has become almost as big a part of Super Bowl Sunday as the actual game. In fact, if you took a poll of random Americans asking them what they are most excited for on Super Bowl Sunday, I think your results would look like this. Non-scientific polls aside, let’s see which TV Network has televised the most Super Bowls. 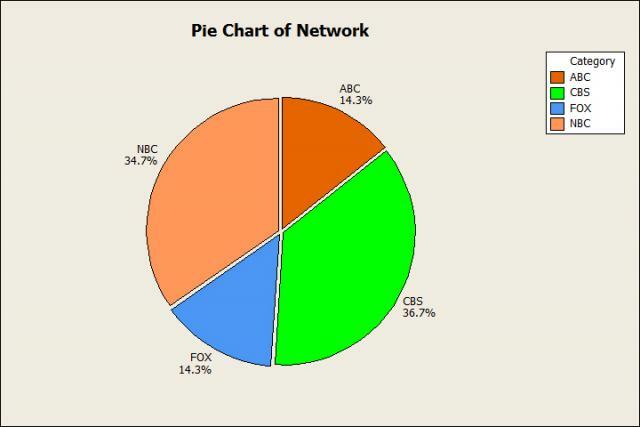 CBS and NBC hold a big advantage over ABC and FOX. In fact, did you know that NBC and CBS both televised Super Bowl I? It’s true! Although CBS must have had more people watch them, because they charged $5,000 more for a 30-second commercial than NBC did. 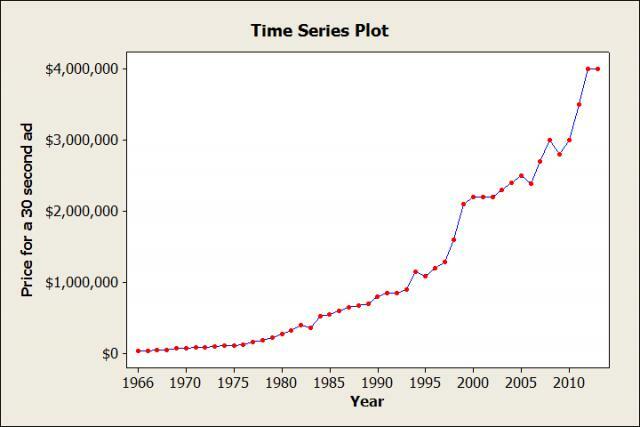 Speaking of which, let’s look at how the price of a 30-second add has exploded over the last 48 years. It took 28 years for the price of a 30 second advertisement to reach $1,000,000. Since then it’s increased by another $3,000,000 in 19 years! If the price keeps climbing at this rate, what will the price be in 2020. What about 2030!? We can use Minitab’s trend analysis to find out. At the current rate, by the year 2020, a 30-second commercial will cost 5 million dollars, with that increasing by 7.2 million dollars by 2030. 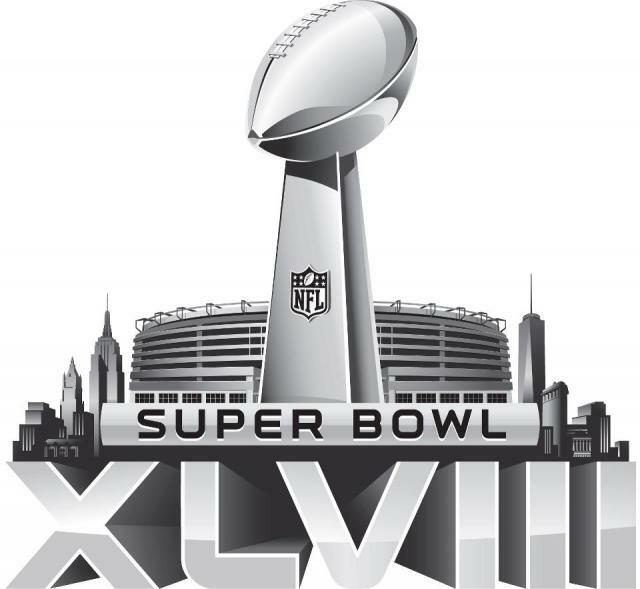 That may sound expensive, but considering the Super Bowl is the only television broadcast in the world where people actually want to watch the commercials, it may very well be worth it! Florida, California, and Louisiana dominate the locations at which the Super Bowl was played. Lots of sunshine in those states. And yes, there have been some Super Bowls in cold-weather states, such as Minnesota and Michigan. But the biggest difference is that those games were played in domes. This will be the first Super Bowl played outside in a cold-weather city. I wrote earlier about how a big part of the reason Peyton Manning’s cold weather statistics look bad (especially when compared to Tom Brady) is because most of Manning’s cold-weather games have on the road while most of Brady’s are at home. But this is uncharted territory for any quarterback. A cold-weather game at a neutral site! I don't think that has ever happened before in the history of the NFL. It’s going to be fascinating to see how it plays out. And that’s all the Super Bowl statistics I have. Hopefully these fun facts will give you something to impress your friends and family with during the game Sunday. Just make sure you’re not talking during the commercials!